The simple answer: It’s the elevation above which any precipitation is expected to be snow, and below which, rain. .TODAY...RAIN. BREEZY. SNOW LEVEL 600 FEET. HIGHS AROUND 39. SOUTH WIND 15 TO 25 MPH. .TONIGHT...RAIN LIKELY THROUGH THE NIGHT. SNOW LIKELY LATE. How can I determine the snow level? Zero freezing level: If the surface temperature is at or below 0 C, and the air above remains 0 C or colder all the way up, the freezing level is zero, or “surface.” This is the usual situation for the colder parts of Alaska during the winter (and spring and fall for the Arctic). The temperature might be way below freezing at the surface and aloft, but we still say the freezing level is zero or surface—even though it really is a non-issue. Single freezing level: If the surface temperature is above 0 C, and the air cools to below 0 C above the surface and remains below freezing above that, then we have the simplest case of a single above-surface freezing level. Multiple freezing levels: If there are inversions (layers where the temperatures increase with height) in the atmosphere that straddle the freezing point, then there are multiple freezing levels. This can happen with surface temperatures above or below freezing (the latter being the more common case in Alaska). These situations can be quite complex and can lead to freezing rain or drizzle or sleet. More about this will have to wait for a future post. How can I find the current snow level? You will notice most of the state—almost everything north of the red line—is in situation #1 above, SFC (surface) freezing level. 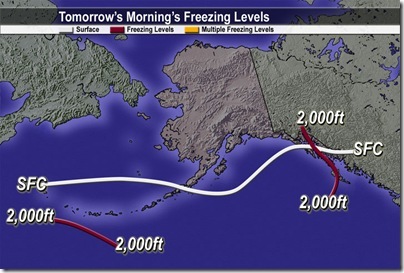 In the Aleutians, the freezing level ranges up to around 5,000 ft (020 means 2,000 ft in aviation speak). In Southeast Alaska it ranges from 2,000 to almost 4,000 ft, but notice how the surface line crosses the green line and runs down eastern part of the panhandle. This is indicating multiple freezing levels…in some places (within the area between the SFC line and the 020 line) the surface is below freezing but there is above-freezing air aloft . How can I know what the snow level will be in the future? 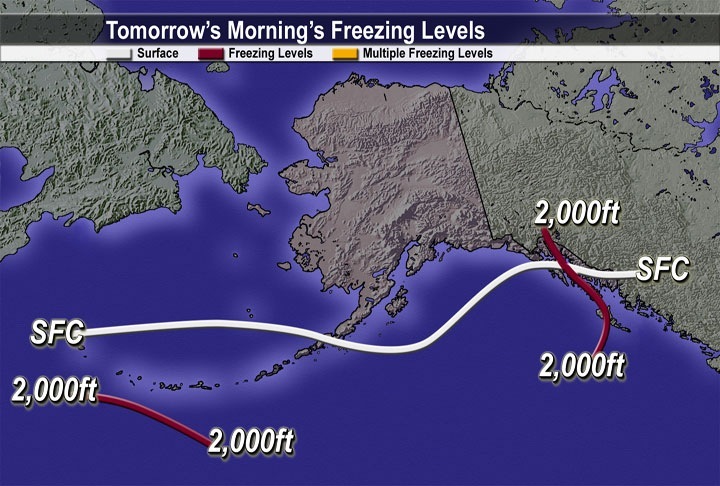 This map from the Alaska Weather TV show gives the next day’s freezing level (but be sure to check the time since the maps are only produced once per day in the afternoon. You can find the current version at http://pafc.arh.noaa.gov/tvwx.php. Look under the aviation maps drop down. Can I estimate the freezing level or snow level from the surface temperature? Yes, but with plenty of caveats. What is needed is to know how fast the temperature decreases with height (a weather element called the lapse rate). The bad news is that the lapse rate is a) not always constant, and b) not always even lapsing (in the case of an inversion–warming with height). The good news is that we can usually spot those situations where there are probably inversions or otherwise tricky temperature profiles. In most situations where you are dealing with a large scale weather system bringing wind and rain or snow, the atmosphere becomes more homogeneous, rather than layered. It is said to be well mixed. This is more often true on the coast and less often true where mountains block the low level flow from the storms, such as most of inland Alaska. If clear high pressure weather is in place, this method is likely to fail. Caveats done for now, the lapse rate in the mixed situations tends to be about 3.5 degrees F per 1,000 ft, or 6.5 degrees C per 1,000 m. Simply figure how many feet or meters needed to reduce the surface temperature to the freezing point. The snow level will be about 1,000 ft or 300 meters below that. Any error is most likely to be on the low side, since the lapse rate is not usually greater than the figures given, but often less. However if there are lots of cumulus buildups then you have an unstable situation and the lapse rate is probably greater, meaning the freezing level may be lower than calculated. In this case the snow level may be lower yet, since showery type precipitation tends to be more vigorous, with a downdraft to push snow flakes and cool air to a lower level. Is the snow level ever so high that there is, for practical purposes, no snow level? Not in Alaska. Virtually all precipitation that falls outside the tropics starts out as snow. Rain is simply snow that melted before reaching the ground. So the freezing level really would be better called the melting level. The one significant exception is drizzle, which can form and fall from shallow, above-freezing stratus clouds. I hope I answered more questions than I raised, but just in case, the comments feature (link below) is a good place to ask for clarification, or add your own ideas or experiences with snow levels, freezing levels or anything weather. Two things come into play. One is that it simply takes some time for the flakes to melt. Another is that melting snow absorbs a lot of heat and cools the air, slowing the melting process. Well, let me expand that second point to include evaporation and sublimation (snow changing directly from solid to vapor). All three of these (melting, evaporation and sublimation) are phase changes that require heat. When falling snow flakes start turning to liquid or vapor they are going to absorb heat from the surrounding atmosphere, thereby cooling it and slowing or even stopping further phase change. The relative humidity of the air determines how fast evaporation and sublimation take place and therefore how strong the cooling effect is. So snow will fall farther through dry, above-freezing air than through humid, above-freezing air. What can you tell us about skew-t log-p graphs and are there any produced for our area, like maybe Juneau, Haines, or Skagway?